This photo was taken last January 2013, during our three months visit in the Philippines. 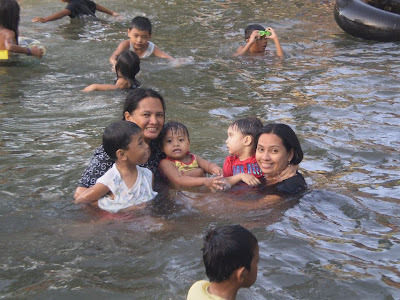 This was at the Cold Nature Spring called Olaer in Gensan’s place. If you’ve noticed there were crowded because this was right after the New Year’s celebration. Everyone wish to go to this cold spring to continue the celebration. We proceed here as well since, it was my request, and it was quite humid during that time too. Therefore swimming in a cold spring would be a great idea. The whole clans were here, we did enjoy this time. I miss everyone back home and wish to stay there instead. In the photo were my two older sisters, my son, my niece, and my other nephew who seems to look into somewhere else. Gensan is also my hometown and I miss Olaer... I have so many childhood memories of this famous resort.